Berdiansk City Court in Zaporizhia region on Friday arrested Artem Matiushyn, one of the suspects in the murder of local activist and ex Anti-Terrorist Operation (ATO) veteran Vitaliy Oleshko, for two months, according to 1+1 TV channel. Matiushyn can appeal the ruling within five days, the judge said. As reported, Oleshko, a member of the Donbas Volunteer Battalion (nom de guerre "Sarmat"), Donbas war veteran, local activist, was shot dead in the center of Berdiansk on July 31. The killer used a hunting rifle. 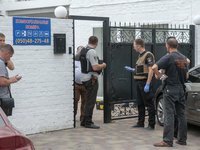 The police detained five suspects in his murder – four in the village of Vasylivka in Zaporizhia region and one more in Berdiansk. People's Front MP Anton Gerashchenko said that Oleshko's killer was a former sniper from the Tornado special task force and also participated in the ATO. The remaining four detainees are his accomplices - athletes from Dnipro and Dnipropetrovsk region.